The Wow! source radio emission entered the receiver of the Big Ear radio telescope at about 11:16 p.m. Eastern Daylight Savings Time on August 15, 1977. "Its now well past is past the 30th anniversary of the detection of that now famous radio source. What have we learned about that signal over this time? Could it have come from an intelligent civilization beyond our solar system, or could it have been just an emission generated by some activity of our own civilization? " This thumbnail shows the location of the WOW signal on my Sky Map. Because the image is stretched into a Mercator projection there is distortion in the placement of the stars and constellations. To be as accurate as possible I point the antenna on the calculated DEC and Ra (Ant RA = 20.02, Dec = -26.32). It still seems a long way from Sagittarius though! What follows is a series of data collections from the WOW area over the years. 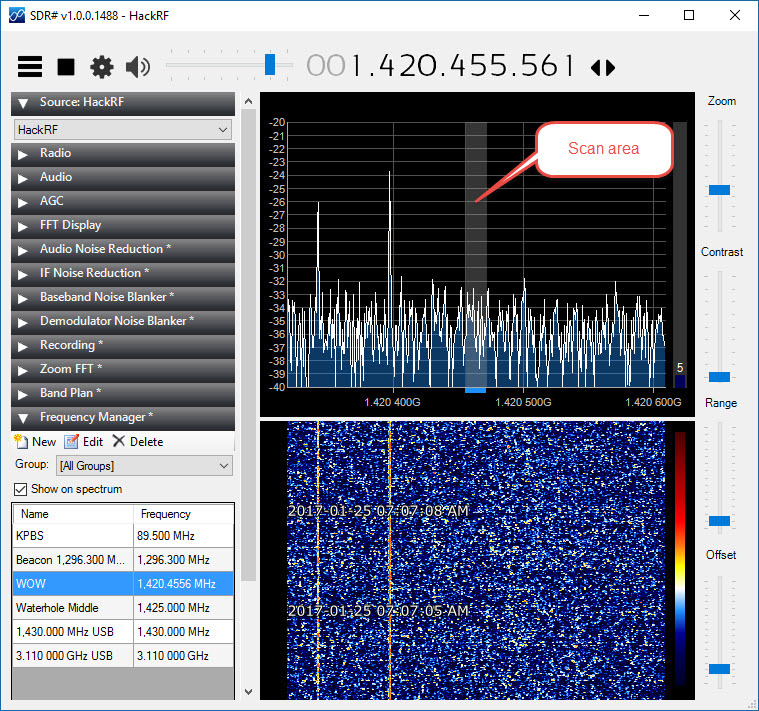 This is the WOW area as seen on the SETI receiver - HackRF One SDR. The area marked in gray is the 20 kHz portion that is scoured for signals. "Hydrogen clouds from comets 266/P christensen and P/2008 Y2 (Gibbs) are Candidates for the source of the 1977 "WOW Signal " ". Original paper. PDF format ( Acrobat reader works best). The station configuration during the test is shown in this SETI Markup Language (SML) document (in XML). While working on upgrades to the software on Zeke I was running SAGAN with the latest version of Control Panel. Alarm went off with an ET in bin 1528. I could not see it on the JPG so I increased the integration time to 8 seconds and let it run for a couple more JPG frames. Still could not see the line and the system failed to alarm again. Since Sagittarius is up in the morning and its the home of the WOW Signal I thought I would put the system on it for a while. When I tuned the receiver to the WOW frequency 1420,455,600 Hz I saw a huge signal right in the middle of the Spec Ana (100 mVolt) . This thing is *way* stronger than anything I would expect from ET so I have to find the cause of it. To be sure; I moved the antenna around and the signal did get stronger in places but never went away even when I turned the antenna 180° so the signal is local not ET with a Bazillion watt transmitter beaming it right at SETI Net. The signal zero beat frequency is 1420,450,900 with the receiver in SSB mode and drifting. I turned off all the equipment in my lab - no change. I shut down my computers - no change. I went around the house and made sure NOTHING was running - no change. I have done everything I can do without a scanning receiver to look around the neighborhood. It could be a new cell phone tower that has come on line, a new TV of one of my neighbors, a new bird developed right inside my receiver, who knows. I'm going to leave the receiver on the signal and wait to see if it goes away. You can listen to it on the audio/video feed from the front page of this web site. I try to visit the WOW area periodically but since it is so low on the horizon I only get a couple of hours a day to look. Today I did see a signal (click on the JPGs below). I was able to move off signal using Az and the signal did drop off as expected. I could not move down in El because I was right next to the lower limit of travel but a +El did drop the signal. I need someone to look at the signal for Doppler using the WAV below. I also need someone to attempt to acquire the signal independently of me. BUSTED - The next day after close examination of this signal I realized that it was a very low level audio note that had crept into my system - not RF at all. It is exactly 3.9 KHz and it is 50 microvolt's in amplitude. This is just enough, with a high enough amount of integration, to trip the alarm. I found this by moving the receiver frequency and noting that the signal did not move. 2007-01-25 WOW.xml WOW 5,6 & 7 all featureless. I collected another 150 Meg of WAV and then WOW set below the horizon. This position is right at the bottom edge of my search area so it doesn't stay in view very long.